"This versatile porch swing seats three comfortably." "Solid wood version with an affordable price tag and many color options." "Made of resin wicker for a classic look with increased durability." "The 4-piece sectional will give you plenty of seating." "All-weather option that will give you a soft spot to sit." "This 7-piece set is durable and easy to assemble." "Comes with two chairs and a matching table in a wrought iron tulip pattern." "The smooth wood offers a surprisingly comfortable seat." "A lighter, slimmer porch glider with an affordable price." "These loungers are a popular choice for their durability and design." Sit and stay awhile outside with a patio set that is just right for you and a friend. The Mainstays Skylar Glen 5-Piece Outdoor Chat Set is popular for outdoor spaces of all sizes and includes two cozy chairs and a cushioned ottoman for each, plus an accent table. 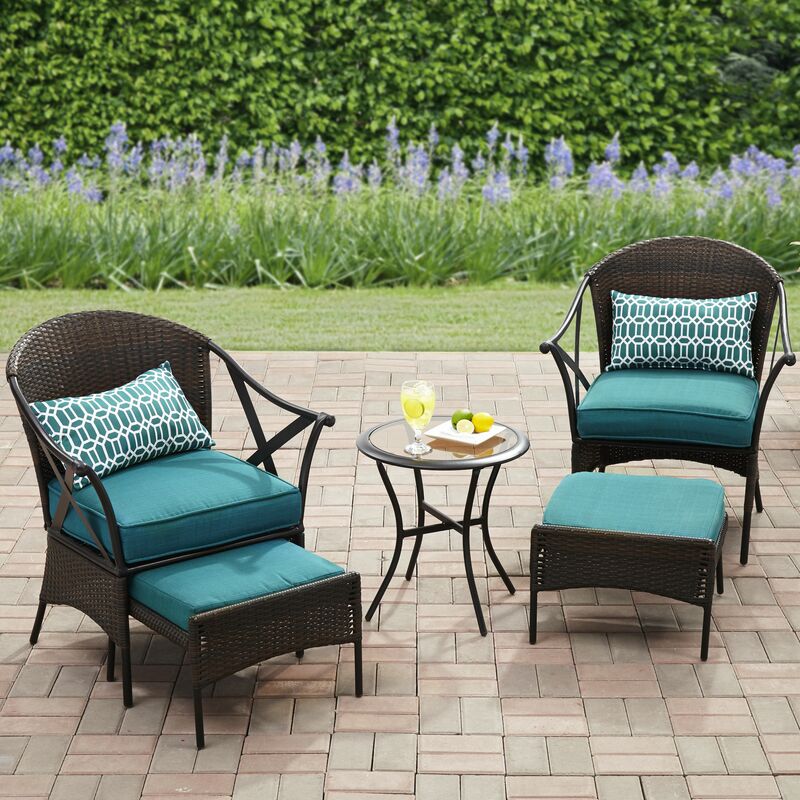 The Skylark Glen patio set is comfortable according to most reviewers with a plush seat cushion. Available in three different color combinations, the set includes a solid seat and ottoman cushion with a contrasting accent pillow. The accent people may not offer enough lumbar support for some people, but that’s an easy pillow to swap if that’s the case for you. What really makes this outdoor furniture set stand out are the space-saving ottomans. People love using them to prop up their feet after a long day, but many also say they make a good extra seating option. When not in use, they can easily be tucked away under the chairs to save space. Adding to the appeal of this patio furniture from Walmart is the fact that the set is easy to assemble, according to reviewers. It makes a great choice for furnishing your balcony, porch, yard, or anywhere else you want a cozy spot for conversation. Sway in the breeze and enjoy easy living with a porch swing. Our favorite find is the Mainstays Belden Park Canopy Porch Swing. This versatile porch swing seats three comfortably but can also convert into a daybed-style swinging platform. Available in your choice of 4 different cushion colors with a matching canopy, the Belden Park porch swing beckons you to sit under the shade and swing to your heart’s content. But if you’re looking to take your relaxation a step further, adjust the safety lock to flatten the swing into a daybed. Think of it as a shaded hammock but with more stability and less risk of flipping or falling. Most people find the porch swing to be very comfortable with an adequate cushion. However, one person did mention that when using the porch swing in daybed mode, they could feel the support bars through the cushion. You will need to put in a little work assembling this porch swing with canopy. Some users point out that the instructions can be a little vague and recommend maybe enlisting an extra set of hands to help put this swing together. Once assembled, though, everyone will want to climb onboard and test the swing in its multiple positions. Overall, the Mainstays Belden Park Canopy Porch Swing offers both versatility and value and is a great choice for swinging and dangling your feet at any time of day. A classic porch piece, Adirondack chairs offer a low center of gravity that feels just right when you want to sit back and relax. The Mainstays Wood Adirondack Chair is a solid wood version with an affordable price tag. Unlike some Adirondack chairs that come unfinished or in simple stains, this version is available in 7 different colors—including basic black and brown to brightly hued yellow and turquoise. Add both color and comfort to your front porch or backyard! A few people point out that the paint seemed like it could use extra protection from the elements and wear and tear. If you’re worried about chipping or flaking, you might want to consider putting a quick coat or two of polyurethane on the chairs before putting them into use. Or, you can opt to let the chairs weather and age into their own special patina. Note that these chairs are made from solid wood so they earn high marks for durability, but they’re not cedar like some higher-end Adirondack chairs. But they are a good value and are easy to assemble, with most people taking less than a half hour to assemble and secure the chair. Any concerns you may have over the durability of these Adirondack chairs may be offset by the 1-year manufacturer’s warranty offered. Take a nap, read a book, soak up some sun—do all this and more on the Better Homes Garden Azalea Ridge Chaise Lounge. This piece of patio furniture is made of resin wicker for a classic look with increased durability. A chaise lounge like this one with an adjustable back allows you to sit up or lay flat for the ultimate in comfort and convenience. Despite the fact that this model won’t recline completely horizontal, sunbathers and nappers find it to be flat enough to still be comfortable. Most people report that this Better Homes and Gardens chaise lounge arrives in good condition and is easily assembled. The only word of warning from users is to be sure to follow the assembly instructions, otherwise, you may struggle to line up the holes for the armrests. There is limited cushion color selection available with this model and the longevity of the cushion is debatable. Some people found that being out in the elements deteriorated the cushion quickly, but that is true for most pieces of patio furniture. On the other hand, the frame and resin wicker material hold up well and offer season after season of use. Increase your patio’s party potential with an outdoor sectional. The Better Homes and Gardens Avila Bench 4-Piece Sectional is a popular pick. With minimal assembly, you can have plenty of seating for you and your friends on this comfortable, durable sectional available at Walmart. Each piece is made from all-weather resin wicker with water-resistant olefin cushions in a neutral hue. You can configure the pieces to your patio requirements or split them apart for separate seating options. Each section has enough weight to stay put where you place it, so use your imagination to arrange and re-arrange each piece in your space. A stainless-steel frame and a 250-pound weight limit per piece mean that this piece of patio furniture is sturdy enough for most situations. And if you need an extra serving station, pull the cushion off the ottoman for a ready-made table to hold drinks, snacks, and more. If you want to keep your options open, this outdoor sectional from Better Homes and Garden is the way to go. Who says that time in the great outdoors means sacrificing your favorite comforts of home? The Serta Laguna Outdoor Sofa is an all-weather option that will give you a soft spot to sit as you enjoy some fresh air or stargazing. This outdoor sofa seat is made from weather-resistant poly-resin wicker that gives it a classic patio look without the brittle downside of real wicker. Four oversized cushions—two on the seat and two to give back support—make this sofa a soft spot to sit. The 6-inch cushions combine the same support and comfort that Serta furniture is known for. Even though most people love the comfort of this patio sofa, it should be noted that it doesn’t have a high back like your typical living room sofa. This isn’t a problem for everyone and is more likely to be an issue for taller individuals. In general, people are impressed by the feel of this sofa but aren’t surprised since it carries the Serta name. You can also purchase other coordinating pieces to complete your outdoor furniture set. And while this Serta outdoor sofa carries a heftier price tag for a single piece of patio furniture, many people find it to be worth the extra comfort. Take your next dinner party outdoors with a weather-ready dining set like the Hanover Lavallette dining table and chair ensemble. This 7-piece set includes six dining chairs with removable cushions and a dinner table that stretches for 5.5 feet. There is very little assembly needed for this patio dining set, just attach the base to the table and place the set on a level surface. The table and chairs are made from rust-resistant stainless steel and are powder-coated for durability. People love the look and space offered by this dining set, but something to be aware of is the 225-pound weight limit per chair. This isn’t an uncommon limit for a patio chair, but it is something to keep in mind as you shop around. You might find the sticker price for this patio set from Walmart to be a little steep but consider that a single investment gives you 6 sturdy patio chairs, a generously-sized dining table, and cushions to complete the look. Host your next dinner party al fresco without worrying about having enough seating or table space, thanks to the Hanover Lavallette Outdoor Dining Set. Bistro sets are a perfect match of two chairs and a petite table for enjoying a cup of coffee in the morning or sipping an afternoon drink with a friend. The Tulip 3-Piece Bistro Set from Better Homes and Gardens caught our eye for its updated take on a classic design. The bistro set comes with two chairs and a matching table in a wrought iron tulip pattern that is a fresh look for these popular pieces of patio furniture. The table and chairs are made from cast aluminum, which makes them sturdy but not cumbersome. Reviewers say that this set has enough weight to not blow over in the wind but is light enough to easily move and arrange. The limited amount of assembly required is also a huge perk. For under $200, this bistro set is also a good budget pick if you’re looking for affordable outdoor furniture that will last. Combine the easy motion of a porch glider with the convenience of a tete-a-tete set with the Jack Post Country Garden 2-Seat Wood Glider with Table. We like this glider since it allows each person to move at their own pace and also includes a table for your beverages or snacks. This outdoor glider is made from extremely durable solid wood construction, but be forewarned that this glider may take a few hours to assemble initially. Users claim the effort is worthwhile and this glider will give you years of enjoyment. In fact, one person bought this glider to replace the same model after 18 years of use! Others purchased it after spending an evening sitting on a friend’s glider. Tete-a-tete sets are made for two people to socialize and enjoy easy conversation, and this Jack Post Country Garden 2-Seat Wood Glider is no exception. The smooth wood offers a surprisingly comfortable seat, and there are no complaints about the gliding mechanisms. There is a substantial 500-pound weight limit for the set as a whole. For a lighter, slimmer porch glider, check out the Best Choice Products 2-Person Loveseat Glider. This seat for two is most often described as “sturdy and comfortable” and hits all the marks for durable, affordable patio furniture. The glider features a steel frame with Textilene fabric stretched tight for the seat and back. As a result, this piece of patio furniture is lightweight and easy to move around if you need to adjust its placement or move it out of the rain. However, the assembly can be tricky according to most users. For under $100, this glider is a good bet if you’re on a budget and don’t mind gliding at the same speed as a friend. Pool patio furniture needs to be waterproof and durable since it’s likely to be exposed to wet towels, swimsuits, and plenty of sunshine. The Keter Pacific Chaise Sun Loungers are a popular choice for their simple assembly and durability. These pool loungers are constructed from a textured rattan that gives a wicker look but improves UV and weather resistance. They’re available in 3 different colors to match your outdoor décor. There are some complaints about an occasional broken spot in the weave of the lounger, but this issue seems to be hit or miss. In many other instances, the Keter Pacific Chaise Sun Loungers have proved their durability season after season. More than one person has found that these loungers are still looking great after several seasons of use in the hot Florida sun. These pool loungers feature an ergonomic design that most people find comfortable. However, you may want to add a cushion if you’re looking for a plusher feel. A two-year warranty backs up your investment in these pieces of patio furniture, and folding feet make them easier to store in the off-season. Our writers spent 4 hours researching the most popular outdoor furniture on the market. Before making their final recommendations, they considered 25 different pieces overall, screened options from 5 different brands and manufacturers, read over 344 user reviews (both positive and negative) and tested 1 of the pieces themselves. All of this research adds up to recommendations you can trust.